Who’s that in the beard? IT’S not every year you get the chance to play Santa but for my first Christmas in France the honour was all mine. 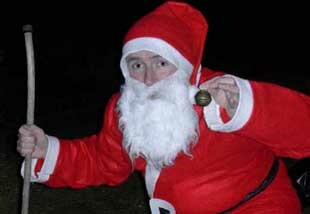 A friend had been twisting my arm since arriving in the Dordogne asking me to be Father Christmas for her daughter. Naturally I had to check that I did not have any other bookings; photo-calls, pantomimes Fame Academy judging panels, that sort of thing. And so it was I found myself on Christmas Eve driving to the house in the full kit of beard, hat and cushion stuffed down my front. It has become a tradition for my friend’s daughter to stay up with her grandparents, uncles and aunts awaiting the arrival of Father Christmas. Then as Santa arrives, dragging a sack full of toys, everyone starts welcoming the old chap with cheers, usually frightening the small girl to death. However, this year was slightly different because as I arrived all the ‘ohhhs’ and ‘ahhhs’ went out but there was a glint in the daughter’s eye as she began to recognise who was under the hat. So I rang my bell even louder and stooped closer to the ground, hoping that she didn’t make a grab at the beard. But I was lucky, turned tail and waddled off out of the door. A few minutes later, after checking the reindeer were put away, I was back in civvies and enjoying a glass of champagne as the presents were handed out. My friend’s daughter loved every minute of the occasion, holding up each toy as she successfully tore through the wrapping paper. Whilst the rest of evening was taken up with two giant plates of seafood, roast duck and enough cake to ground Santa for a week.